BERLIN, MARCH 3, 2016 — Will the German Bundestag ever make up its mind about the genocide? This is the question raised last October when the news broke that the government coalition of Christian Democrats and Social Democrats (CDU-CSU/SPD) had agreed to put the issue on the back burner, for an undetermined period of time. The reason, clearly, was Berlin’s concerns not to endanger negotiations with Turkey regarding the refugee crisis that is destabilizing German politics and threatening the European Union with internal strife if not dissolution. My view at the time (Armenian Mirror-Spectator, “Recognition, Realpolitik and the Ravages of War” October 22) was that the genocide resolution could wait, if necessary, but that it was urgent for German political leaders, eager to fight the root cause of the refugee crisis, to acknowledge the nefarious role played by Erdogan’s Turkey in the Syrian war. I argued that, however vital in managing refugee flows, Turkey was itself part of the problem, by virtue of its support for the so-called Islamic State. Unless that issue came to the fore, hopes to deal with the refugee crisis merely through negotiations would be in vain. Last week, the question was raised again and in a forceful manner, when the opposition Green Party forced debate on a resolution in the Bundestag, demanding recognition of the genocide. 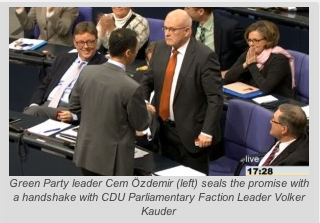 The lengthy discussion that followed Green Party leader Cem Özdemir’s presentation ended in a highly unusual fashion: Özdemir withdrew the resolution on condition the government parties pledged to reach a vote on the issue by April 24 of the current year, a condition they accepted and sealed with a handshake. What had happened? The resolution the Green Party hoped to put to a vote was a text based on an earlier all-party resolution, which the Green party had revised last fall in collaboration with experts from the coalition parties, CDU-CSU and SPD. In presenting the motion, Özdemir recalled that all parties had agreed on April 25, 2015 that what the Ottoman Turkish government had perpetrated against the Armenians was genocide. He also recalled that a hundred years ago the German parliamentarians had debated the issue, and then, as now, Realpolitik had won the day; Imperial Germany, an ally to Ottoman Turkey in the war, had explicitly admitted it would do all to keep its alliance, even if that meant the elimination of the Armenians. Özdemir said that the current government, in its plea to postpone the issue so as not to anger Erdogan, was guilty of “cynical Realpolitik,” and criticized it for allowing a foreign government to set the agenda in Berlin. For this reason, his party was presenting the resolution as its own initiative and calling for a vote. In closing, he quoted a letter sent him by Archbishop Karekin Bekjian, Primate, Diocese of the Armenian Church in Germany, who wrote that the aim was truth and recognition; the church leader pointed to the discussion process ongoing in Turkish civil society and urged German legislators to send a signal supporting this. Recognition of the genocide would signify the beginning of a democratic process. In the energetic debate that followed, speakers for both coalition and opposition parties intervened, all announcing that their factions would not vote for this resolution. The reasons were several. For the opposition Linkspartei (The Left), an abstention would be in order for two reasons related to the content of the resolution; Ulla Jelpke, speaking for the faction, explained that, first, although using the word “Genocide” in its title, it watered down the concept in the body of the text; secondly, the role of Germany, though mentioned, was not adequately characterized as an accessory to genocide. The speakers from the coalition parties focused instead on the timing of the Green Party’s initiative, pointing to upcoming elections in three federal states on March 13, and suggesting there were opportunistic motives behind the move. More critical, they pointed to the extraordinary European Union-Turkey meeting on refugees scheduled in Brussels for March 7. No one questioned whether or not it was genocide in 1915, and Claus Brähmig (CDU-CSU) was not the only one to repeatedly refer to the consensus achieved by all parties last April. It was rather, he argued, a question of timing. A party colleague suggested the Greens wanted to damage diplomatic relations with Turkey just ten days prior to the EU-Turkey meeting. Then, he concluded his intervention asserting that they would present the genocide resolution this semester, i.e. by summer. Principled Agreement or Rotten Compromise? It would be easy to cry sell-out and accuse the German legislators of capitulating. Perhaps that was the reaction of some hardliners. But that might be a hasty judgement. As Özdemir himself acknowledged, no solution to the refugee crisis can be found without negotiating with Erdogan and helping Turkey deal with the millions of Syrians who have found refuge there. But, he said, one had to deal with an autocratic leader with more self-consciousness. Perhaps the debate has sent such a message to Ankara. First, the Greens did succeed in forcing debate on the issue. Secondly, no one equivocated on the question of genocide and all confirmed that a consensus would be attainable. Nietan’s warning, that no one in Turkey should view the postponement as the end of the matter, places pressure on the Erdogan government, without jeopardizing negotiations on the refugee crisis. The Bundestag has in effect pledged that it will vote up a resolution recognizing the genocide by the end of April, and that cannot be music to Erdogan’s ears. As should be obvious, ending the war in Syria is a precondition for solving the crisis and the temporary ceasefire has raised hopes that diplomacy may shift the current war dynamics. Both behind the scenes and in the public domain — especially the press — pressure has been mounting on Turkey to end its de facto support for ISIS. That includes NATO warnings against Turkish attacks on Kurdish anti-terror troops. The court decision to release Cumhuriyet editor Can Dündar and Ankara bureau head Erdem Gül, after three months in prison, is a political signal from inside Turkey to the world at large: the two had been imprisoned on espionage charges because they had published photos and facts showing Turkish supplies of weapons to the ISIS terrorists. In short, the truth is seeping out. The court decision to release them pending trial was violently contested by Erdogan. Viewed in this broader political context, the extraordinary session in the Bundestag last week might be read differently. Perhaps journalist Carstens is right in considering the compromise a win-win outcome, “a compromise that made them all into winners, above all, parliamentary democracy.” Included among the eventual winners are those rightly demanding genocide recognition.